Time and creativity trump money when it comes to Halloween costumes. As we did last year, we’re using what we have for this year’s Halloween costumes. We have a lot of dress-up clothes in our basement, which I’ve gathered over the years from yard sales, Freecycle, and after-Halloween clearance sales. 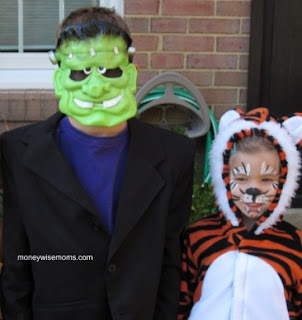 Last year, my son wanted to be Frankenstein, so I picked up a black suit jacket at a thrift store for $3 and used duct tape and a wire hanger to make the square shoulders. We borrowed a mask from a friend for the parties we attended, then did a full make-up treatment on Halloween night. One of the girls was a cowgirl, using a hat we’ve had in the dress-up pile forever (it was from the party store about five years ago), a Western-style shirt, and jeans. The other was a tiger wearing a clearance purchase ($5) from a few years’ ago. This year, I’ve challenged the kids again to use what we have in our dress-up bucket as the basis for their costumes. We can check Freecycle and thrift stores if we need extra parts.We’ll see what they come up with! How do you keep your costume costs down?